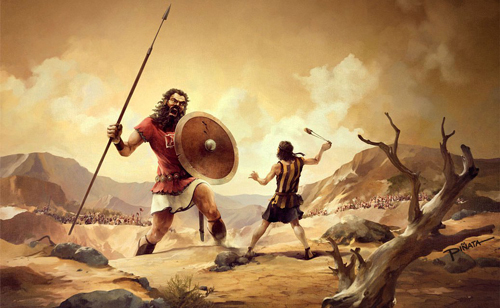 Almost everyone knows the David and Goliath Bible story from I Samuel, Chapter 17. King Saul’s Israelite army was challenged to find someone to face hand-to-hand combat with Goliath, a nine-foot Philistine warrior covered in heavy armor. The fate of the two nations hinged on who would win this fight. David, the teenaged shepherd, volunteered to take on the giant when soldiers with common sense stood aside. Goliath had a sword, javelin, and spear. David had a slingshot and a few stones. David’s zeal to defend God’s honor and his faith in the Lord’s provision gave him the confidence and power to sling a stone into Goliath’s forehead. David depended on God. Goliath depended on his strength and military hardware. The giant learned too late that pride goes before a fall, literally. But as years went by, the tables turned. David’s success brought him fame and fortune. The shepherd nobody knew became King David. People sang his praises in the streets. He lived in a palace, defeated his enemies, and was given whatever he wanted. He became subject to pride and a quest for pleasure. II Samuel, Chapter 11 shows us that this led him to covet another man’s wife, take her as his own, and have her husband killed. Now who was the bully? In one sense, David had become Goliath. But the difference in the two is that David knew better. Even though he had for a time put himself on the throne of his own heart, he knew that God belonged there. After the prophet Nathan exposed him, he repented of his sin and humbled himself before God. He turned back to obedience. We can hear his cry of remorse in Psalm 51: “Have mercy on me, O God, according to your unfailing love; according to your great compassion blot out my transgressions. Wash away all my iniquity and cleanse me from my sin,” (Psalm 51:1-2). Aren’t we all tempted like David and Goliath? Don’t we sometimes focus on ourselves, our material possessions, and our pleasures, at the expense of others? Aren’t we prone to depend on our own intellect and the tools and skills we have acquired to do whatever needs doing, without humbly asking God for help? The good news is that we don’t have to live that way. We can return to the faith we once knew. Most of us can remember a time when we prayed more for God to help us meet the challenges that we face every day. We prayed for ourselves and for other people. We didn’t rely so much on our education, vocation, credit cards, investments, or portfolios. We knew we needed God. In our 21st century American culture it is common to hear people appeal to our desire to be empowered, healthy, prosperous, and highly educated. And those things are not evil in themselves. But as Jesus warned his disciples, “…it is hard for a rich man to enter the kingdom of heaven” (Matthew 19:23). It’s hard because we are all tempted by pride. We have to stay in touch with the Father to confront our everyday challenges. This is true whether we face overwhelming dangers, alluring temptations, or just the weariness of our daily obedience. We need God’s guidance and the power of the Holy Spirit. And our access to God is prayer. But we must be careful to pray with humility. In spite of what some may say, God is not obligated to do whatever we say, when, and how we want it done. No matter how great our faith may be, He is Lord. He knows what we really need. Sometimes financial success or excellent health may keep us from finding spiritual victory. We may need suffering in our offering. Through prayer we can ask the Holy Spirit to slay the Goliath of selfishness that lurks within us all. If we see ourselves on the throne of our hearts, He can put us back where we belong. Even if he uses a slingshot.